When you go to Middletown RI to dine, you're in for a real treat. Several restaurants are listed below which are our favorites. 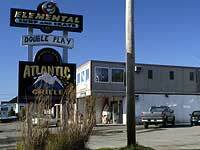 Here's a popular diner along the strip in Middletown. If we go to Newport early in the morning we stop here at the Atlantic Grille because they serve only for breakfast and lunch, and have a fantastic breakfast menu. Several menu items are named First beach, Second, or Third beach. It's really cool, and so good. This is one place we look forward to going to, but it's not a big restaurant, so you have to get there early. 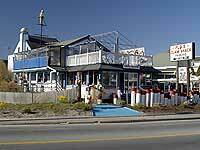 Flo's Clam Shack is a good place to get some seafood. They have been famous for their clams since 1930. We got the Fisherman's Platter, and sat outside at the picnic tables to enjoy the view and all the excitement. They also have a bar upstairs. You order outside on the side of the building, and then go inside to pick up your order. Lots of fun, but can get pretty busy during the summer. 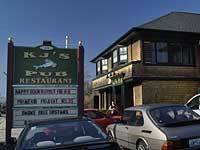 KJ's Pub and Restaurant is located on the Middletown strip, but we haven't eaten there yet. It looks like a romantic place to dine though.